Caswell-Massey Sandalwood Soaps & Products - P.C. Fallon Co. The rich, woody and warm Sandalwood line from Caswell-Massey is a fragrance known for its long-lasting scent. This spicy and exotic Sandalwood fragrance features the sensual sandalwood essence, along with hints of Bergamot, Citrus, and Spice with lingering notes of Cedar and Musk. Currently available items are usually In Stock. 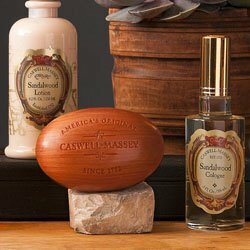 Highlights of the Caswell-Massey Sandalwood line are the distinctive woodgrain soaps, available as a set of three, and also as soap on a rope. Also offered are luxurious Sandalwood cologne, body lotion, bath and shower gel, and shave essentials.